Former Box Elder star spent most of his career on the bench, but shined in bowl game. (Jeremy Harmon | The Salt Lake Tribune) Brigham Young Cougars running back Riley Burt (34) runs into the end zone for a touchdown as BYU faces the Western Michigan Broncos in the Famous Idaho Potato Bowl in Boise, Idaho, on Friday, Dec. 21, 2018. Provo • Another BYU football player will leave the school with one season of eligibility left as a graduate transfer. 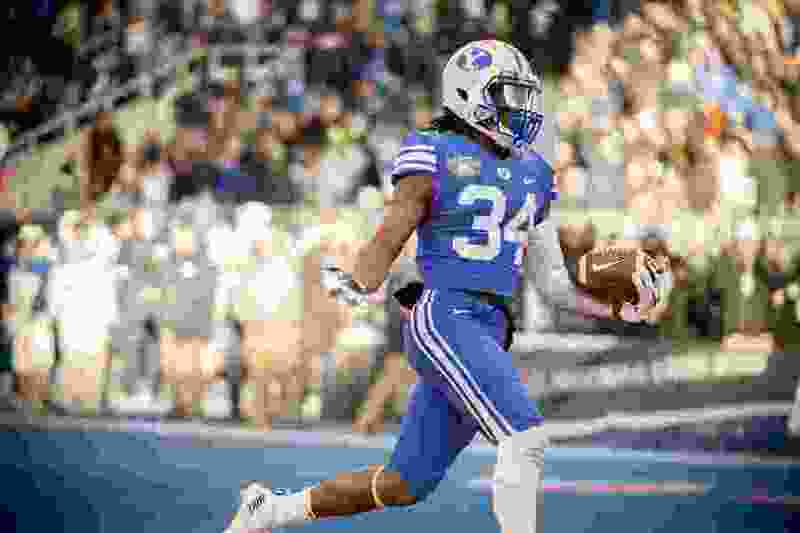 Running back Riley Burt, who shined in the Cougars’ 49-18 win over Western Michigan in the Famous Idaho Potato Bowl last month, said on social media Tuesday night that he is moving on. “After much consideration, I have decided to grad transfer and play my last season elsewhere,” Burt noted on Twitter. The redshirt junior who grew up in the tiny northern Utah town of Mantua and prepped at Brigham City’s Box Elder High School rushed for 110 yards and a touchdown on 13 carries in the bowl game. He spent most of the season as the fifth-string running back and carried the ball 59 times for 323 yards and two touchdowns. Burt was moved to defense on at least one occasion during his BYU career but did not record any defensive statistics. Offensively, he finished with 96 carries for 513 yards and three TDs. His departure is another blow to BYU’s depleted group of running backs. Seniors Matt Hadley and Squally Canada have exhausted their eligibility. BYU’s leading rusher last season, freshman Lopini Katoa, will return after rushing for 423 yards and eight touchdowns in 11 games. He missed the last two games with a knee injury but is expected to be healthy before spring ball begins in March. Earlier in the week, BYU defensive back Isaiah Armstrong announced he, too, is leaving the program as a graduate transfer. Last month, seldom-used receiver Akile Davis did likewise. Also, linebacker Christian Folau and defensive tackle Wayne Kirby have announced they plan to transfer. In other BYU personnel news, freshman tight end Dallin Holker is leaving the program for two years to serve a church mission, according to his father’s post on Facebook. The all-stater from Lehi High School earned a starting spot early in the season and caught 19 passes for 235 yards and a touchdown.